Gov. Susana Martinez on Thursday signed the first-of-its-kind legislation supported by the UNM Health Sciences Center to make a life-saving drug that reverses the effects of opioid overdoses more widely available to New Mexicans. House Bill 370, passed unanimously in this year’s legislative session, puts naloxone – often known by the trade name Narcan – in the hands of law enforcement officers. The drug will also be dispensed to people undergoing narcotic replacement therapy, such as methadone, as well as newly released inmates who have been diagnosed with opioid addiction. Martinez signed the bill in a ceremony on Thursday, April 6, at Serenity Mesa Youth Recovery Center in Albuquerque. The signing ceremony also included the bill’s lead sponsor, Rep. Sarah Maestas Barnes, cosponsors Rep. Rebecca Dow and Rep. Derrick Lente, and Joanna Katzman, MD, MSPH, an expert on overdose prevention and director of the UNM Pain Consultation and Treatment Center. 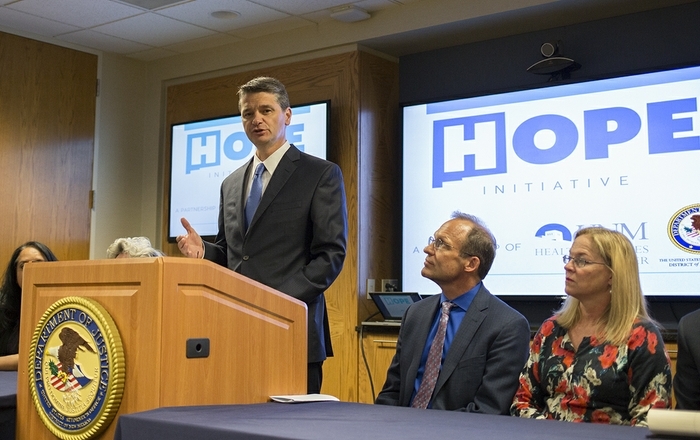 The New Mexico HOPE Initiative - a partnership between the UNM Health Sciences Center and U.S. Attorney's Office - has launched a new public awareness campaign aimed at tackling the state's opioid and heroin addiction crisis.